Like noises in a swound!" 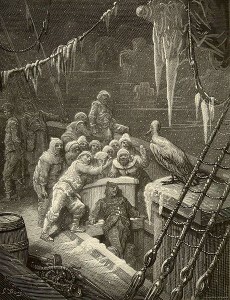 The full text of The Rime of the Ancient Mariner. I always assumed Coleridge had talked to Arctic whalers or at least read their writings. By the time you get to the most famous polar literature such as Farthest North by Fridjof Nansen (1898) then so much of it (to me) is about the noise and movement of the sea ice. Nansen wanted to prove the existence of what we call the "transpolar drift". He deduced that this current must exist because of artifacts, wood, and wreckage found on the Greenland coast which must have originated in Siberia or the Eurasian Arctic. Nansen realized he could use this current that he had deduced existed, to reach the north pole. He then put together a truly epic and wonderful scientific expedition with the ship Fram especially built to cope with the Arctic ice. The expedition ran from 1893-1896 and I can't recommend reading his books enough. Even the dedication at the start of the two volumes is wonderful: "To her who christened the ship and had the courage to wait". The "her" he was writing of was his wife Eva, and in 1893 she waved goodbye to Nansen, the Fram and the rest of the crew for 3 years. Nansen’s ship Fram with a passage from Farthest North describing the noise of the sea ice. Picture of Fram from the wiki commons, the screengrab of text from the internet archive. I love the last sentence: "There is a pleasant, comfortable feeling in sitting listening to all this uproar and knowing the strength of our ship." I used to think when I was a kid that I could have been a crew member for someone like Nansen. But now I have been to the polar regions, I know they were different people. All of which brings me to a video posted by Eric Larsen today on his YouTube channel. Listen to the noise of the ice. You can hear Nansen's grumbles, snarls - and even the organ pipes. A pretty good example of the silence of the Arctic isn't it, and I always assumed the noises like this are why the polar bears are not intimidated by for example the sound of gunfire. In the ocean sound travels further at low frequencies, and this squeaking of ice floes rubbing together is a high frequency. That means it doesn't propagate far. But if you wanted to listen to a low frequency noise in the ice, say for example that made by a submarine, then the squeaking of the ice floes could make that difficult. On that basis it could be worthwhile doing some research into the noise of the ice floes scraping together. Somebody probably has done that already. So back to Nansen. After drifting across the Arctic for three years, the ship and all members made it safely back to Norway. The story is, of course, more complicated than that, but having waited all that time for him, Nansen's wife Eva wrote of the ship "Fram is a pigsty". If you want to see a demonstration of the large scale movement of Arctic Ice then a wonderful resource is provided by the International Arctic Buoy Programme (IABP).There are many pieces of scientific kit on the Arctic Ocean ice sending back data such as air pressure and aire temperature in real time. Some special ones even record the characteristics of the upper ocean as well (these are called ice tethered profilers - ITPs). The location of International Arctic Buoy Programme (IABP) buoys on 20 February 2013. The IABP www site has a some wonderful movies showing the drift of these buoys over time. It amazes me that Nansen was not only bright enough to deduce the existence of the transpolar drift - but that he was willing to stake his life on it. The quote from Nansen's wife Eva is from John Maxtone-Graham: Safe Return Doubtful.